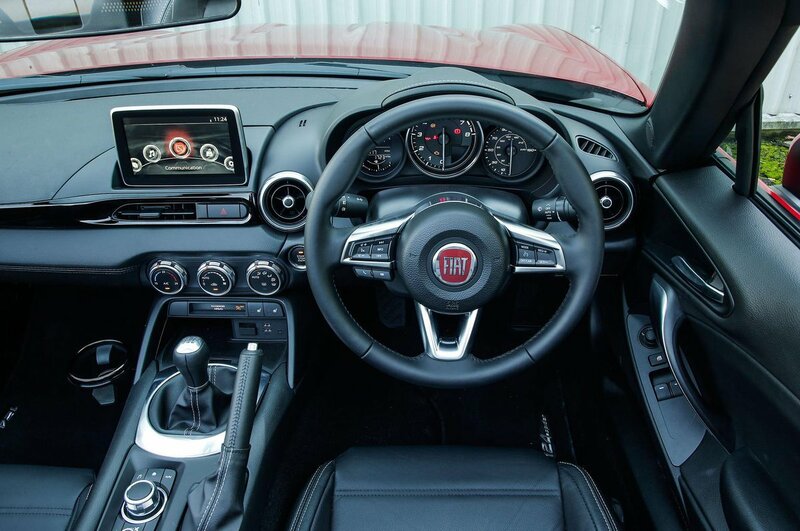 Fiat 124 Spider Interior, Sat Nav, Dashboard | What Car? 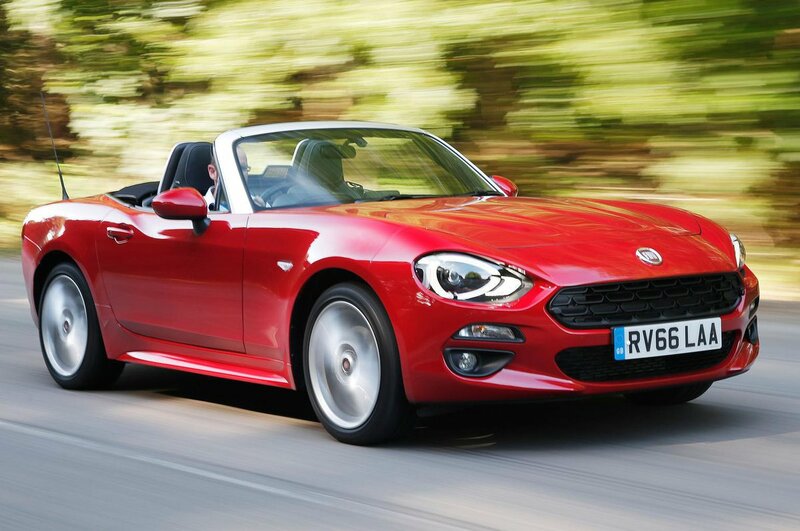 Those familiar with the Mazda MX-5 will feel at home in the 124 Spider, because the interior design is identical; only some different finishes and equipment set it apart. All-round visibility from the driver’s seat is very good, even with the roof up - in fact, the reversing camera on Lusso and Lusso Plus models is nigh on redundant - and head room is just acceptable for six-footers. Dropping the manual roof is a moment’s work and can be done without leaving your seat: unclip the latch, pull back and push down into place. It’s also just as easy to reverse the procedure. Clear instrumentation is viewed through the chunky steering wheel that’s adjustable vertically but not horizontally, with a prominent rev counter taking centre stage. Seats controls are manual, too; there’s no height adjustment but it’s easy to find comfort. Lusso and Lusso Plus models get heated leather upholstery for the deeply sculpted seats, which drivers of sturdier frame might find a bit restrictive. The upper swathes of the cabin are coated in soft-touch plastic, with supplementary leather in Lusso and Lusso Plus. Look further down and you’ll find scratchy plastics that are disturbingly thin in some places, but not surprisingly so for a roadster of this price. All models have leather on the steering wheel and gearlever, cruise control, a keyless start button and Bluetooth phone integration. Spending an extra £500 on the entry-level Classica model gets you a 7in infotainment touchscreen and DAB radio, but not the sat-nav that’s standard on the other two spec levels. The infotainment system is easy to use and responsive to both touchscreen inputs and the rotary controller, but maps can be a little slow to load.